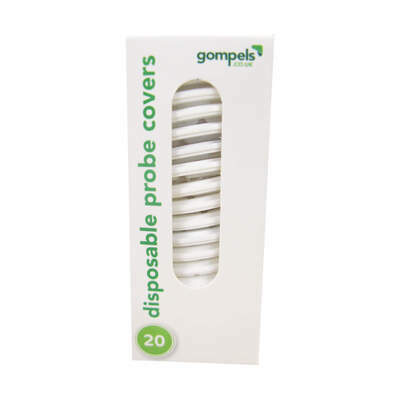 For environments where patient monitoring is a constant requirement, our Gompels Disposable Probe Cover 20 Pack maintains your high level of hygiene. They are compatible with our own branded infrared thermometer and slip over the tip to keep it clean and sanitised for the next patient. Supplied in a pack of 20, they are suitable for single use and can be disposed of after each testing. These probes are lightweight and moulded to suit their purpose. They can be stored along with your First Aid resources and come in a durable cardboard box. Each probe cover helps to effectively prevent the spread of illness in busy environments. These thermometer covers have been designed specifically to protect the tip of our Gompels Infrared Thermometer. We also stock a wide range of First Aid tools from our Digital Thermometer through to our Nursery First Aid Kit.